In Chesapeake's continued efforts to collect acreage in the Haynesville Play, the company has agreed to lease from International Paper Corporation deep rights on 13,000 acres of timberland in Northwest Louisiana for $263 million (article, press release). In case you don't have a calculator handy, that works out to be a lease bonus of about $20,231 per acre. Today's New York Times features an article ("Gas Rush is on, and Louisianans Cash in") about the Haynesville Shale and the economic impacts to the region. The article was written by Adam Nossiter, the Times' main post-Katrina reporter in New Orleans. It is a generally positive piece, although there is some big city condescension that bubbles up periodically. The article focuses on a few people who have received big lease bonus checks and the possibilities for the region. It portrays the Haynesville Play in a positive light, referencing the possibility that the play might yield 250 trillion cubic feet of recoverable gas (a number that Aubrey McClendon of Chesapeake has tossed out in conference calls). There is no groundbreaking information in the article, but it's always interesting to see how the rest of the world perceives what is going on down here. There has been some recent press about the potential damage to groundwater from natural gas drilling, especially with the rush to drill gas shales. CNN Money recently posted an article and video story and pointed out that many of the new finds are near large metropolitan areas, including the Dallas metro area, Pittsburgh, Cleveland and New York City. This is getting a large amount of attention in the northeast where the Marcellus Shale is attracting a lot of attention. While this is not a recent discovery, like the Haynesville Play, it is causing a great deal of excitement and trepidation in an area that is not as experienced with oil and gas exploration as the south central portion of the U.S. The big issue is the chemicals and water pumped into the wells as part of the fracing process. Interestingly, in 2005 Congress passed a law that made the chemicals proprietary business information, which allowed the drilling companies to keep them confidential. (An aside: it is frightening to think of the lobbying that must have gone into creating that very specific law.) It puts the state and federal regulatory bodies in a difficult position. Because the companies don't have to disclose the chemicals, the regulatory bodies can't truly understand the threat to the groundwater. Outside of this particular issue, many advocates claim that states have insufficient regulations to protect groundwater in general. I'm in no position to take sides in this debate, but one thing is clear: for the truly successful development of the Haynesville Shale (and other shales), there must be a balance between maximizing production and protecting the surface land, which includes the health of the people, the quality of the drinking water, minimizing pollution and protecting agricultural uses, among others. Chesapeake Energy has become a huge marketing/PR player in recent years, from the pretty tree on the company's website to the expensive PR campaigns the company has run recently (American Clean Skies Foundation, "Citizens of the Shale" infomercial with Tommy Lee Jones). Chesapeake's latest large scale PR venture is shale.tv, a soon to be launched faux news channel that focuses on the subject of drilling the various shale plays in the US, focusing mainly on the Barnett Shale, where the company has been feeling some heat from the externalities associated with drilling in an urban area. Shale.tv and the "Citizens of the Shale" campaign are both produced by ad agency Ackerman McQueen. Chesapeake is nothing if not aggressive, both in getting what it wants (in this case massive producing acreage) and in putting its best foot forward. They have bankrolled various campaigns that are vehemently pro-natural gas and soft-pedal drilling in urban areas. The shale.tv campaign is nothing new to Chesapeake (see cleanskies.org), but it should be interesting given the statements Chesapeake has made about maintaining the site/station's independence. Chesapeake is forthright (or egomaniacal) enough to put its name on the site placeholder as the underwriter, but only time will tell if there is real journalistic independence. I cannot opine on the impacts of drilling in Ft. Worth, but I imagine as the Haynesville Shale plays out, especially near urban areas, there will be much discussion of the pros and cons of drilling in residential areas. I have no doubt that Chesapeake will be a strong and clear voice in that discussion. EnCana released its second quarter earnings today. They were impressive and all, but from my perspective the most interesting part of their 38 page news release was the mention that they have preliminary results from their second horizontal well in the Louisiana Haynesville Play. The release was short on specifics except to say that the well flowed at an initial two-day rate of 15 MMcf/day. This volume puts it close to the huge Petrohawk 16.8 MMcf/d test well nearby. Additionally, EnCana noted that the company has leased a total of 370,000 net acres in the Haynesville Play. The largest acquisition was 89,000 acres from Indigo Minerals (Indigo's press release puts the acreage at 89,500). I finally got around to reading the transcript from the July 2 joint conference call with Chesapeake (CHK) and Plains (PXP) regarding their joint venture to develop CHK's Haynesville acreage. There was a lot of good information there, although they kept the tastiest morsels to themselves. CHK CEO Aubrey McClendon stated that their research indicates that the Haynesville Play contains recoverable gas reserves of 250 TCF from over 700 TCF of gas in play. That's 250 trillion cubic feet. They firmly believe it is the biggest reservoir in the US and the fourth biggest in the world. 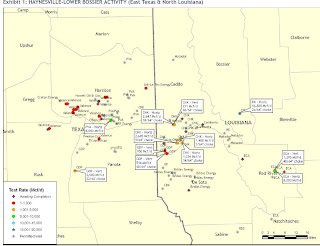 McClendon defined the core area of the Haynesville Play as approximately 3.5 million acres in LA and TX. They come to this figure based on analysis of 70 penetrations over the past two years. There is additional acreage outside of the core area that is considered less productive and is not counted in the 3.5 million acres. This is old news that merits repeating, but CHK estimates that the Haynesville wells will recover between 4.5 and 8.5 Bcfe, and they use 6.5 Bcfe to calculate their estimated ultimate reserve (EUR). They consider 6.5 Bcfe a conservative number and referred to it as their "floor." They expect things to move quickly in the Haynesville Play, especially compared to the Barnett Shale. They expect the borders of the play to be established in 6 months, compared to 5 years for the Barnett. They also see the Haynesville field as being easier to mine, both logistically and geologically than their other shale plays. The Haynesville Shale is geologically superior to the other N. American shale plays. The reservoir is very consistent with high porosity. It also has fewer underground and surface challenges that the other shale plays face. Additionally, it over-pressured shale. Haynesville Shale is twice as pressured as the Barnett, Fayetteville and Woodford Shales and it is 50% more pressured than the best areas of the Marcellus Shale. McClendon feels that the gas from the Haynesville Play will fetch a higher price in the market given the fact that the field is located closer to the east coast than some of the other fields. CHK has 750 (out of 4,000) landmen in the Haynesville area. CHK has a very aggressive multipart strategy to lease property, but the huge number of boots on the ground give it access to the smaller landowners. Plus, CHK is using Twin City to do the urban leasing around Shreveport using the expertise Twin City developed in Ft. Worth leasing Barnett acreage. The CHK/PXP deal is structured so that CHK benefits handsomely the faster the play is exploited, so expect Chesapeake to keep up their strong momentum going forward. My ears are ringing from the screeching sound of the fallout from the slide in natural gas prices this month. As I write (midday July 22), gas futures are trading at $10 even, which is down about 20% from recent highs. The collateral damage to the gas producers' stocks seems even greater. Big Haynesville names such as Chesapeake (CHK), Petrohawk (HK), XTO (XTO), Goodrich (GDP) and Plains (PXP) are down between 6% and 12% today (on a 4-5% drop in gas prices). They are also way off their highs for the year, which were admittedly a sharp peak. CHK (-30% off recent high), HK (-31%), XTO (-30%), GDP (-37%), PXP(-24%) are all feeling the pain. WSJ: More Big Deals Ahead? Friday's Wall Street Journal published an interesting article reflecting on the deal between BP and Chesapeake in Oklahoma. While the article discussed the deal, the real point was that the oil and gas majors are way behind in domestic onshore production because of their focus in recent years on foreign opportunities. They are buying their way into unconventional plays, such as the Haynesville Shale, and are paying up since they are the last to arrive at the party. The article also cited Shell's deal with EnCana to develop the Haynesville Shale as well as Conoco's deal to buy Burlington Resources a few years ago. Bottom line: many people (myself included) expect to see more big deals as the majors seek the stability of North America over the tumult of foreign nations. Smaller producers such as Chesapeake have developed expertise in drilling in unconventional plays, so the bigs ultimately might end up functioning as investors rather than producers. That would be an interesting change of course. There has been much PR-driven hype lately about the so called "Pickens Plan," T. Boone Pickens' plan to save us from our thirst for foreign oil. One interesting aspect of this plan is the emphasis on natural gas, especially for automobiles. While the Pickens Plan is just one plan, it has been useful in shedding light on the potential importance of natural gas for our country. I'll be interested to see how that impacts the national dialogue on energy. This afternoon, Chesapeake announced that it has sold all of its interests in the Arkoma Basin Woodford Shale Play in Oklahoma, which represents approximately 90,000 net acres. These properties have been producing approximately 50 MMcf per day. Chesapeake received $1.75 billion in cash from BP. The company intends to redeploy the capital in its Haynesville, Barnett and Marcellus shale plays. It is interesting news that Chesapeake would give up its interests in its own backyard to focus on these other plays. It really shows their desire to move fast and heavy. They've got a ton of cash to deploy and a somewhat more narrow focus. Should be interesting. With all of the news coming out about the Haynesville Play, it can be confusing to keep it all in perspective. I found this map on an investment site and thought it did a great job of putting things in perspective. It is current as of mid-July with the notable addition being the big announcement from Petrohawk of their test in Bossier Parish (the blue star). I just want to scream! I've been wanting to pick up some Mainland Resources (MNLU.OB) stock for the past few weeks, but I kept waiting for it to come down. Too late now! Today, Mainland and Petrohawk (HK) announced a joint venture deal for Petrohawk to assist in (and fund) development of Mainland's acreage in the Haynesville Shale. Mainland will retain rights in the shallower formations to drill in the Cotton Valley and Hosston formations. The JV deal, in which Mainland will transfer 60% of the Haynesville leases to Petrohawk, calls for Petrohawk to the be designated Operator of the development. For the first well drilled in the Haynesville Shale, Petrohawk will fund 100% of the costs. The second well will be funded 80% by Petrohawk and 20% by Mainland, and the third well will be 60/40. Additionally, Petrohawk and Mainland will enter into an arrangement for Petrohawk to gather and market Mainland's production from the shallower leases. Earlier this year, Mainland, which is a newly formed company, purchased 2,695 acres in the East Holly Field in DeSoto Parish for the purpose of exploring the Cotton Valley formation. As luck would have it, just a few months later, news about the Haynesville Shale broke and Mainland found itself sitting on prime acreage that it acquired for very little cash. The price of Mainland has been rising steadily over the past few months and the news of the Petrohawk deal sent it up more than 12% today. I am guessing that this news makes the stock rather fully priced, but I've been wrong before. In any case, Mainland ($6.55 as of 7/15/08) has done pretty well for a bulletin board stock that was trading at just over $1 in March 2008. 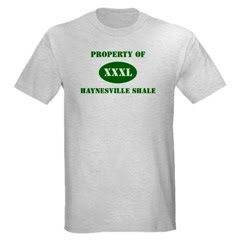 And now for something completely different: I happend upon a site that sells a couple of funny Haynesville Shale related t-shirts. 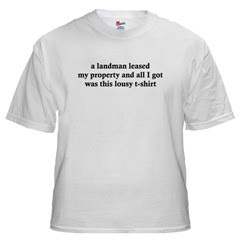 One says, "a landman leased my property and all I got was this lousy t-shirt" and another is a mock athletic practice shirt that says "Property of Haynesville Shale, XXXL." I guess this expresses the two opposing views of the Haynesville Play as information becomes available: 1) I got screwed by signing too early and 2) I got rich by waiting. Web site: http://www.cafepress.com/haynesville. Is a Cubic/Chesapeake Deal Coming? I saw this drawing in a recent Cubic Energy (QBIK.OB) presentation. The orange on the map is Chesapeake Energy, the blue is Goodrich Petroleum and the yellow is Cubic. Chesapeake and Goodrich recently struck a joint venture deal whereby Chesapeake will operate Goodrich's leases in this area. Assuming the blue area now goes orange, it appears as though Chesapeake has Cubic completely surrounded. Is a deal between Chesapeake and Cubic upcoming? I'm just speculating, but a few things give me the idea: 1) Chesapeake is flush with spending money from its recently signed joint venture deal with Plains Exploration, the recent issuance of new debt and an upcoming issuance of new equity. 2) Chesapeake is deal happy. They are cowboys with big egos. They like to win. 3) A Cubic deal would probably be relatively small to Chesapeake. 4) I bet they want to fill in the holes in their leasing map. Controlling Cubic's leases would give them a lock on their core area. What does a deal look like? I don't know, but I imagine Chesapeake will be putting up the cash and the expertise to drill the wells. GMX Resources, an Oklahoma City E&P "pure play" company, announced today that it has increased its focus in the Haynesville Play. (For more information about GMX, check out this information filled presentation, complete with charts, logs and maps, for the Collins Stewart Conference on July 8.) While the announcement indicated that GMX is excited about their Haynesville acreage, it did not include any results from test wells (they haven't drilled any yet). First, GMX has increased its leased acreage to 27,500 acres in the Haynesville Play by closing leases on 7,300 net acres in Texas (Harrison, Marion and Cass counties) and Louisiana (Caddo Parish). This is not really new news, however, because the preliminary agreement was announced earlier. With an announced 80 acre density, this implies 344 well sites. Additionally, GMX announced that it increased its capital expenditure budget from $195 million to $271 million. Much of this additional capex will be used for drilling and lease acquisition in the Haynesville Play. The capex increase will allow the company to drill between four and six horizontal wells in its Haynesville acreage. Interestingly, from a corporate perspective, GMX announced that it has refocused its drilling program to focus on gas shale. The company has a strong presence in the Cotton Valley area, so it is natural to focus on the Haynesville Shale that lies below much of its existing acreage. GMX will also deploy two Flex "purpose built" rigs in early 2009. This past Sunday’s New York Times featured an interesting article on the leasing frenzy going on in the Marcellus Shale fields located in the Catskill Mountains region of upstate New York. 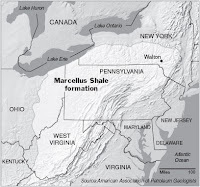 The Marcellus Play is mostly located in Pennsylvania and has been drilled for years, but with the advent of horizontal drilling and other new technologies combined with high natural gas prices, producers are pushing into New York to lease property and drill the Marcellus Sale. Although not quite as frenzied as what is going on in the Haynesville Shale (the article noted $2,500/per acre bonuses and 12.5% royalties – amounts now considered to be bottom fishing in the Haynesville Play), landmen are scurrying around the region to lease properties for drilling. While the article noted the economic boom for the land owners, it focused on some of the negatives associated with drilling, including pollution, noise, groundwater contamination and the social impact to neighboring communities. The Shreveport Times has already touched on the subject in an editorial, but in the frenzied environment in northwest Louisiana and northeast Texas, I fear that too many people are blinded by how much money they can make and are not considering the big picture. In leasing property, especially small pieces, it is important to specify what activities can take place at the surface. It is also important to include indemnifications from the entity leasing the property (that are upheld by the ultimate lessee – many of the leases are subsequently sold off) protecting the landowner if something bad happens. Land owners must also communicate with neighboring owners to make sure they are not going to allow activities that will negatively impact your property. Bottom line: it is absolutely vital that landowners 1) work with an attorney to develop the lease and 2) communicate with their neighbors. On Monday June 30, Petrohawk announced the results from its initial horizontal well in the Haynesville Shale. The well was placed in production on June 29 and produced at an impressive rate of 16.8 mmcfe per day with casing pressures of 5,600 PSI on a 26/64” choke. The well was drilled to a depth of 11,005’, and the horizontal portion was 3,880 in length. The completion of the well included eleven stages of fracture stimulation. The well, Elm Grove Plantation #63, is located in the Elm Grove Field in T16N-R11W-S9 in Bossier Parish. The Elm Grove Field will be the hub for Petrohawk’s Haynesville Shale operations. In the announcement the company also noted that it has accumulated 275,000 net acres in the Haynesville Shale. It is currently drilling three horizontal Haynesville Shale wells and expects to have six rigs drilling wells in the Play by mid-September. Petrohawk expects to have ten rigs operating in the Haynesville Shale by year end 2008. The Wall Street Journal picked up the news of the Chesapeake/Plains deal and offered additional news gleaned from the conference call that accompanied the announcement (Link to print version of article). The article notes that the agreement between Plains and Chesapeake values the 550,000 acres of leased property at $30,000 (another analyst, Rehan Rashid of Friedman, Billings, Ramsey estimates the value to be $25,600/acre). Given that Chesapeake estimates that it paid $2.5 billion for the leases, the deal values the property at six times (!!!) what they invested. Clearly, they executed lots of leases that paid low bonuses before the news of the Haynesville Shale broke. Chesapeake got paid handsomely for acting quickly and keeping a secret. Now that the cat is out of the bag and the land owners are becoming more educated and banding together, Chesapeake and other gas companies won’t be getting 6X on their future leases, that’s for sure. I was a little surprised to see that the price of natural gas continues to steadily rise, closing at $13.31 today. If the price keeps rising, natural gas executives are going to hit the ground in northwest Louisiana and eastern Texas with shovels and pick axes to drill these wells by hand! Expect the leasing activity to continue at a frenzied pace. The Chesapeake/PXP press release had some other interesting goodies. With the announcement, Chesapeake stated that it expects the 550,000 acres it has leased to date to yield between 23 and 44 trillion cubic feet of natural gas equivalent (tcfe), net of an assumed 25% royalty. The company gets to this number assuming 80 acre spacing, which would support 6,875 horizontal wells in its leasehold. Using an estimated ultimate reserves (EUR) of 4.5 to 8.5 bcfe (billion cubic feet of natural gas equivalent) per well, they get to the 23-44 tfce number. Chesapeake confirmed that the initial production rates on the eight completed horizontal wells is between 5 and 15 mmcfe (million cubic feet) per day on “restricted chokes” of 6,500 PSI (in the Barnett and Fayetteville Shales, Chesapeake often operates with open chokes). This leads to the EUR assumption of 4.5 to 8.5 bcfe. This estimate blows away their experience in the Barnett Shale (2.5 to 3.0 bcfe) and Fayetteville Shale (2.2 to 2.8 bcfe), so you can imagine that these guys are eager to move forward quickly. Chesapeake also confirmed that it is operating five drilling rigs in the Haynesville Play at this time with the intent of mobilizing at least 12 by year end 2008, 30 by year end 2009 and 60 by year end 2010. This should yield 600 wells over the next three years. With numbers like these, I would suspect we will haven’t seen the last big deal. Chesapeake acknowledged that as of June 30, 2008 it has leased 550,000 acres. This transaction implies that PXP will have net claim on 110,000 of those acres. The transaction is interesting as a Gulf player is entering the shale game in a big way riding the coattails of the biggest shale player in the country in Chesapeake. PXP is loaded with cash but lacked the shale experience. Chesapeake is going to need tons of cash to exploit the hundreds of thousands of acres it is collecting in the Haynesville Shale, and it would strain the company to keep going to the debt and equity markets. I look at it as a win-win deal. I’m sure Chesapeake didn’t want to give up claim to 20% of the acreage it has worked so hard to lease, but this deal is a lot more attractive and less dilutive to the company’s stakeholders. For PXP, they have tons of cash on hand and are buying what appears to be a very attractive asset and the expertise of the most experienced company in the industry. If the Haynesville Shale turns out to be as big a play as everyone thinks, it should be a good deal for both players.